The January Blog Challenge is my ideal way to kick off the New Year: with a steady stream of new content & encouragement from/for my blogging friends! Post, at least once, every single day in January. (Ignore the first few days, or backdate your posts and just pretend!) No guidelines on content, no other commitments. That means that if your 31 posts turn out to be all photos, so be it! The goal is just to sit down and update every day. 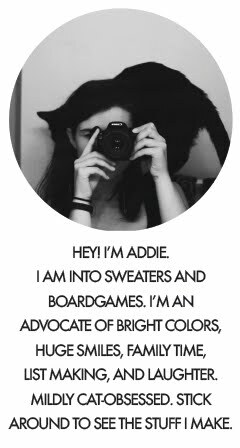 On my right sidebar, I made a little badge you can put on your blog if you so choose (because badges are fun! And really, I just spent far too long figuring out how to make a scrolling text box, so you should make it worth my while, haha. ), and if you click on it, it will lead you back to this post, where you can scroll down and see a freshly updated list participating blogs. That's the other fun part about this: comments! Try to leave some daily comments on the other participating blogs--you never know what fun people you'll discover or which friends you'll make--& expect the same for your posts! It's nice to have an audience & this is a sure-fire way of hearing from them! So let me know if you choose to participate, & I will add you to the list. Give it a go & see what you can make happen! Yay, I'm glad you're going to, Amber! Jessica - Alright, copy the text in the box below the badge. Then go to "design" at the top right side of this window. It'll take you to settings & layout of your blog. Then go to "add gadget" & scroll down to "add html". Paste the code into the content area, save it, & position the new gadget where ever you'd like. Hope that helps! I think i did it? but I don't get the cool pic thinger. ole well. OK, I couldn't make it click-able (I think the HTML tags are not matched up properly). So, delete everything before "< img src = " ...and so on. The HTML should look like this. It won't be a clickable banner, but you get the purty blog badge! No, that was entirely my fault. I fail at html code! Anyway, it should be fixed, so you can try it again & the picture should work. re tried everything, now I got the banner!! I can't seem to comment on your post from today! I was gonna say: Come visit me then :P in MD or VA, whichever ! Awesome!! I missed your blog so much! I just read all your new entries and coming across this I'm wondering if I should finally start a blog. I have some pieces of my own and it sounds like a supper fun experience. It's not too late at all! Dive right in, let me know what the link is & I'll add it to the list. Blogging can be a total blast, & I'd love to see what you made! Ee, I'm excited to see you back, and I hope you don't mind if I hop onto the challenge (albeit marginally late as well).